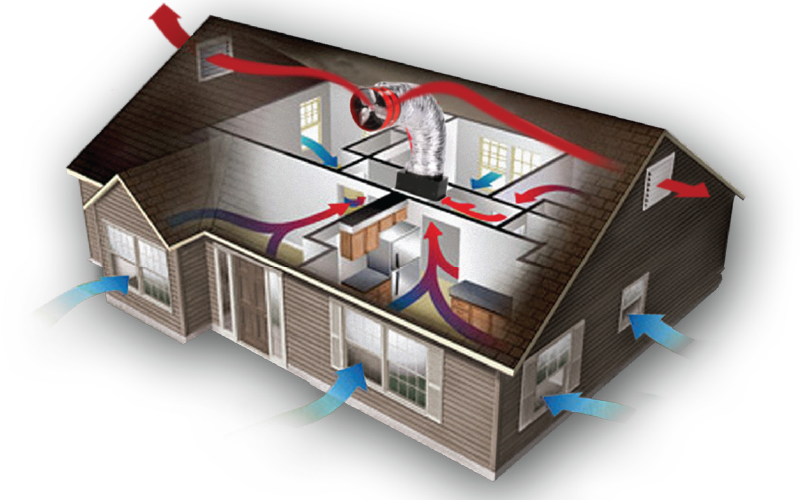 When whole house fans are turned on, the fans will pull the cooler outdoor air into your home, through your windows, across your living space, into the attic, and out the attic vents, replacing the hot, stale air. This helps cool the home and attic by up to 30 degrees Fahrenheit or more. When using a QuietCool whole house fan, we recommend starting by cooling the area which will be most occupied. For example, in most family situations, the early evening is spent in the kitchen and family room area. Assuming this is the case, it is where you would want to start cooling. As it gets later in the evening, and even cooler outside, we recommend opening more windows in other rooms of your home. Then, when it is time to sleep, close all the windows in the home except those in the bedrooms that are occupied. This will provide each room with a cool breeze as long as needed. Remember when using a QuietCool system to be sure not to open too many windows or open any single window too wide. 3-6’’ and just a few windows will suffice to make your home a fresh-aired paradise.